Spring is upon us and graduation time has arrived! General Rental would like to offer some simple tips when planning your event. If you are looking to book a tent here are some things to keep in mind. You will need about 5′ around the perimeter of the tent for staking. For example, if you are looking at renting a 20’x20′ tent, your yard will need to be at least a 30’x30′ area. General Rental also requires that Digger’s Hotline must come out and mark any utilities. Digger’s Hotline is a free service. In the area where the tent will be erected, there can not be any overhead wires or any low hanging branches. Also remember you will want to make sure your tent is installed on the most level area of your yard. 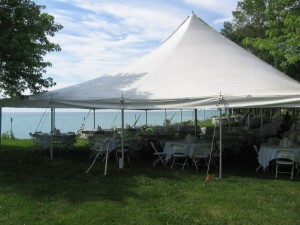 Tents can be a great asset to ensure any party is a success. Tents will not only shield you from the rain, but it will help keep you shaded on those hot sunny days. Plus don’t forget the little things! General Rental can supply the tent lighting, tables, table covers, chairs, and any food service items you can think of. Our extensive food service equipment ranges anywhere from coolers and cold food bars to grills, fryers, coffee makers and chafing dishes. Not to mention, our variety of tableware and serving accessories. We rent most everything! You are welcome to stop in or give us a call and will be happy to help plan your event. 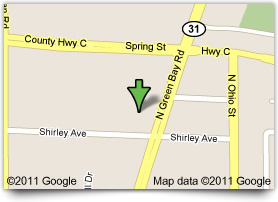 General Rental offers delivery service to Racine, Kenosha and the surrounding areas. Good luck to the Graduates of 2012! Print article This entry was posted by lisa on March 9, 2012 at 7:06 pm, and is filed under Uncategorized. Follow any responses to this post through RSS 2.0. You can leave a response or trackback from your own site. General Rental has been providing Racine, Kenosha, Oak Creek, Franklin, Burlington, Lake Geneva and Union Grove with top quality rental services for over thirty years.